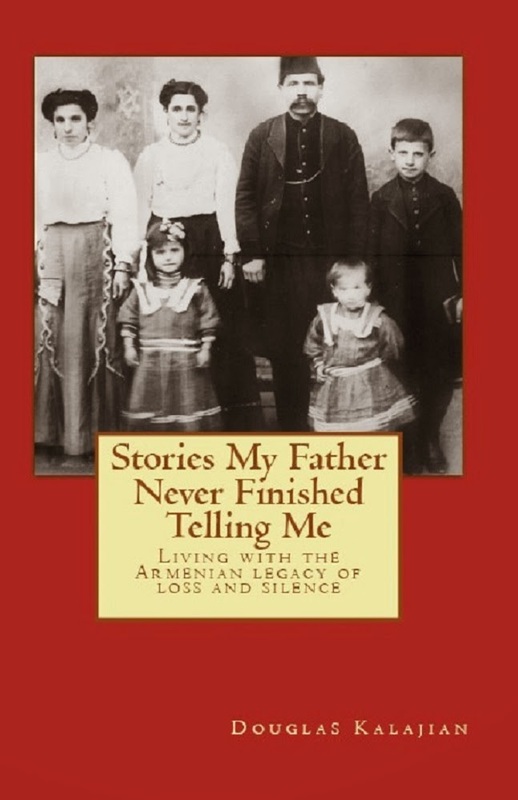 Would you like to hear a not-so-funny story? Doug and I moved to inland South Carolina 6 months ago after a 40-year run in south Florida. Our reasons for leaving included the excessive heat, humidity, and annoying hurricane seasons. We’d had enough! 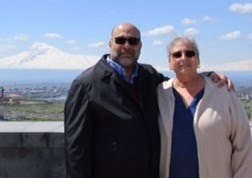 Our new location suits our needs: an Armenian church in Charlotte, proximity to a major airport (so we can visit family and travel to exotic locations), and to avoid the impact of hurricanes. And then came Hurricane Florence - barreling into the North and South Carolina coasts! We’re pretty far inland, but Florence is headed our way as a tropical storm ready to dump A LOT of rain. Power outages are imminent as is major flooding. So, I’m trying to write and post this before the lights go out. Are we prepared? You bet. Bottled water, gas grill, canned food, batteries, flashlights, board games, etc. Right now we’re eating whatever is in the freezer so these foods won’t go to waste. Freezer foods we must consume! 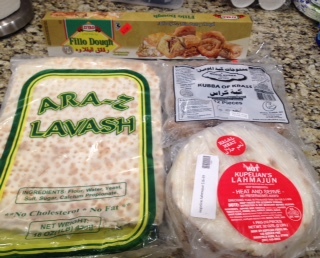 Lahmajoun, kufteh, basterma, lavash, fillo dough (you know, the usual!) and a few other goodies. I’ll end here so that I can get cooking before it’s too late. I’ll be back after the storm leaves and power is restored. Update: Florence will be a tropical storm when it reaches us. This doesn’t mean we’re out of the woods; it just means the winds won’t be as fierce. The rain is another story. 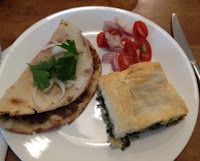 After I posted the original piece, I got busy in the kitchen and whipped up a tray of spinach pie with the on-hand ingredients (recipe follows). Since the oven was on I heated up some lahmajoun as well. A mini side salad, parsley and onions completed our 'hurricane' lunch. Not a bad meal under the circumstances! Out of the freezer and into the oven - while we still have electricity! Lightly grease an 8” x 11” baking pan. In a skillet, sauté the sliced onions in olive oil, until onion is softened, but not browned. Remove from heat and set aside to cool. In a mixing bowl, combined all of the ingredients except the fillo dough and the brushing butter. Open the fillo pkg. and remove the sheets, covering them with a lightly dampened tea towel and plastic wrap to prevent the sheets from drying out. Working with one sheet at a time, place in the baking dish so that the sheets hang over the 2 long sides. Brush each sheet with butter until the 5 sheets are used. Spread the spinach mixture evenly over the fillo sheets which cover the bottom of the baking pan. Fold the hanging fillo sheets toward the center, brushing with extra melted butter, if necessary. Make sure the fillo dough covers the spinach filling. Brush additional butter on the top fillo layer. Using a sharp knife, cut through the layers into serving pieces. Bake for 35-40 minutes, or until top is golden brown. Hope you are safe and eventually dry ! !